TaskAdder will allow you to add tasks to your Toodledo account while on the go from your Pre. It does NOT sync tasks. It provides a simple way to add tasks without having to remember the complicated Toodledo syntax used to enter tasks by email, SMS, etc. On initial launch, you'll enter your Toodledo login info (email and password). TaskAdder will then login to Toodledo and grab your Folders and Contexts. 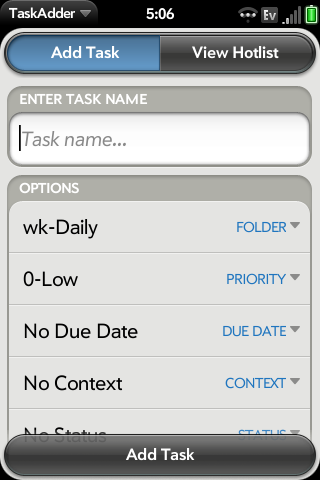 You can then easily enter a new Task and select Folder, Priority, Due Date, Context, Status and Repeat. TaskAdder also has an option to allow you to view your Toodledo hotlist.